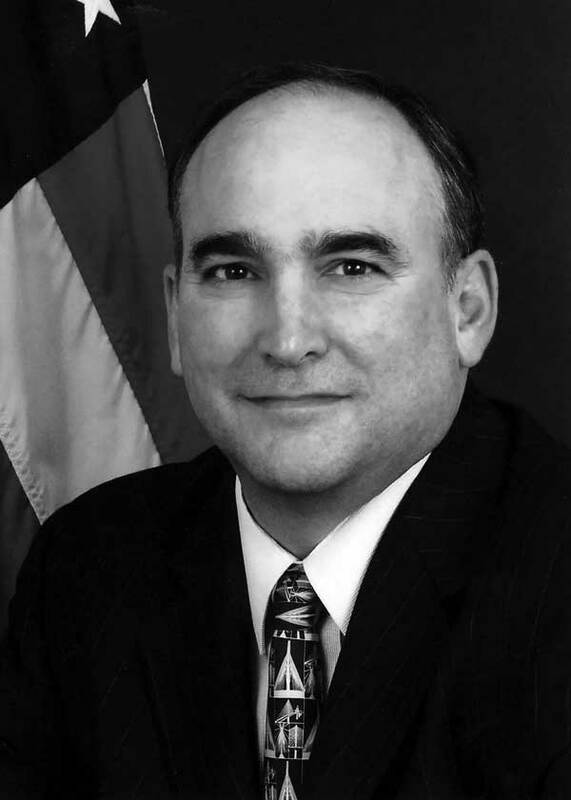 Gregory G. Nadeau became the Federal Highway Administration’s deputy administrator in 2009. During his 27 years in Maine state government, he served as the Maine Department of Transportation’s deputy commissioner for policy, planning and communication, senior policy advisor to a Maine governor and a member of the Maine House of Representatives. He spoke with Innovator about Every Day Counts, FHWA Administrator Victor Mendez’s innovation initiative, which is designed to accelerate the mainstreaming of innovation and shorten the delivery time of highway projects. How did Every Day Counts come about? Administrator Mendez has long been an innovator, as he demonstrated during his tenure as director of the Arizona Department of Transportation. 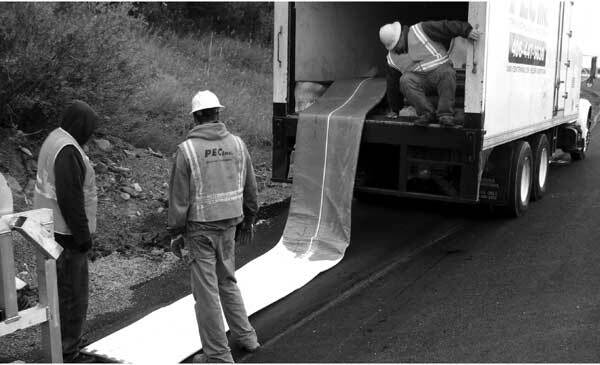 Victor helped implement what is commonplace in many states today, including innovations like rubberized asphalt, cable median barriers and design-build. Victor’s leadership at FHWA is shaped by his view—and that of Secretary Ray LaHood—that there’s no time to waste in adapting to the changing needs of the 21st century transportation system. Every Day Counts was launched to prepare FHWA and our state and local partners to meet that imperative. The name, which Victor came up with, is a statement by itself. He was trying to project a sense of urgency to the effort. At its core the name means exactly what it says. Every day we’re on the job, we’ve got to find ways to maximize value to the taxpayers, minimize impact on communities, protect the environment and, above all, keep our highways as safe as possible. EDC will identify new practices, technologies and innovations that will help FHWA and our partners achieve those goals most effectively. What’s the goal of the initiative? The process of delivering the Federal-Aid Highway Program relies heavily on state and local transportation agencies, as well as the consulting and construction sectors. The goal of EDC is to provide these partners with national leadership and accelerate the deployment of state-of-the-art practices in planning and construction, as well as the rapid deployment of technology and innovation. Victor and I believe strongly that the best ideas will come from our own employees on the front lines of project delivery and our partners who deliver the projects. There are three initial core elements. One is shortening project delivery time. We’re bringing together people within Federal Highway to identify practices and policies that can accelerate the process of delivering a project—along the entire continuum from concept to actual ribbon cutting. Two objectives are important in the context of shortening project delivery. One is that the longer it takes to deliver a project, the more expensive it becomes. Every year of delay not only increases the actual cost due to inflation, but also delays the benefits of a project, such as safety improvements and economic benefits. Secondly, the longer a project is delayed, the greater the potential for negative impacts on the community. If congestion becomes worse, it erodes both air quality and quality of life. Some of the questions EDC will address are: How do we shorten the process and improve environmental outcomes? How can we more effectively engage citizens in their communities earlier to determine the effectiveness and desirability of a particular transportation solution? The second core element of the initiative is accelerating innovative technology deployment. Many tried-and-tested technological innovations that have been available to transportation agencies and contractors for some time have not yet achieved widespread mainstream use. EDC isn’t necessarily about inventing the latest new mousetrap. Instead, it’s about identifying and deploying innovative practices and technologies that have been proven to work. It’s about ensuring those technologies that can make a difference in safety, lower costs and improve value for the taxpayer, and improve project delivery time are rapidly deployed across the country. EDC is about the outreach, education and incentives that will help accelerate this process. One example of promoting innovative construction technology is the showcase that Highways for LIFE sponsored in Virginia on precast concrete pavement technology. The technology has been around since 2001, but it has had only limited application in six or eight states. As more corridors around the country become more congested, solutions like precast pavement will become more necessary. EDC is intended to speed the deployment of technologies like that, which have the potential to provide higher-quality infrastructure, more value to taxpayers and less disruption to the traveling public during construction. The third element of EDC is internal. We call it Going Greener. Victor would like Federal Highway to be a shining example for all public agencies on how to reduce our carbon footprint and, in turn, achieve value for the taxpayers. Thanks to an idea submitted to EDC by one of our employees, we’re setting all of our printers to double-sided printing. I can tell you that it’s cut my paper consumption in half. To date, 56 recommendations submitted by our employees are in the process of being implemented. We have an EDC Going Greener coordinator in all 52 Division Offices across the nation and in every office in our Washington, D.C., headquarters. How does Highways for LIFE—which promotes use of proven innovations to build better-quality highways faster, more safely and with less impact on motorists—fit into this effort? Highways for LIFE is one of the key tools in our toolbox to achieve the objectives of EDC. Byron Lord and the Highways for LIFE staff are key players on the EDC Accelerating Innovation and Technology Deployment Team, which is led by Associate Administrator Michael Trentacoste and Director of Field Services Amy Lucero. It’s designed to provide financial support to owners and contractors to essentially mitigate the risk associated with utilizing a new technology or construction practice. The goal is to fund innovative solutions that are not yet in the mainstream. Highways for LIFE helps financially with the risk premium that is often an obstacle to employing the use of new innovative construction practices or technology. I believe EDC will need to take the Highways for LIFE program to another level to meet the administrator’s bold objectives for the initiative. Our goal is to accelerate the market penetration of innovative solutions so the market itself will eliminate the need to subsidize that risk premium. We’re also looking at how to make more efficient the process leading up to the construction of a project—i.e., planning, permitting, utility relocation, right-of-way acquisition, all those things that can often significantly contribute to costly delay in delivering a project. EDC is about establishing priority initiatives and identifying specific opportunities to improve the efficiency of the delivery of projects or the deployment of innovative technology. What separates it from other programs is that we’re going to assemble implementation teams around each priority initiative and expand the market penetration of these innovations to a point where they really make a difference on a national scale. These teams and our entire organization will work with our state and local partners as well as industry to focus on the deployment of initiatives that will make a difference. And we will establish standards for measuring the outcomes. You referred to the three core elements of the initiative as "initial." What’s next? The mission of EDC is not just to identify priority initiatives, achieve successful deployment and outcomes, and put a checkmark in the column of success. The essence of the administrator’s initiative is institutionalizing a culture of innovation at Federal Highway so the process of identifying innovation and rapidly deploying it will become core to its mission. It’s a philosophy of continuous improvement. We want to ensure that our program is accountable, transparent and efficient so that every dollar we’re charged with administering is effectively invested. The needs of our transportation system are great, and we have limited resources to fund them. Those resources are likely to remain tight for the foreseeable future. So we must be motivated to adapt to these 21st century realities. It’s more important than ever to find ways to deploy essential transportation solutions in the most cost-effective way possible. Twenty-first century technology and practice must be deployed on a national basis to our state and local partners. They’re hungry for it, so there’s a real window of opportunity to promote innovation. When the Montana Department of Transportation tried innovative trenchless technology to rehabilitate deteriorated culverts, it fixed 10 of them in a matter of hours instead of days, without excavating the roadway or interrupting traffic flow. As a result of its experience on the Highways for LIFE-funded project, the agency plans to use trenchless technology routinely to rehabilitate deteriorated pipes, especially on heavily traveled highways where lane closures would slow down travelers and adversely affect businesses. The successful project is detailed in Montana Demonstration Project: Innovative Culvert Rehabilitation Using Trenchless Technologies, a Federal Highway Administration report available at www.fhwa.dot.gov/hfl/projects. A cured-in-place pipe lining system, in which a seamless, jointless polymer liner is laid through the existing culvert and inflated so that it conforms to the culvert’s interior walls. A sliplining system, in which a smaller-diameter pipe made of high-density polyethylene is installed in the existing pipe and the space between the two is filled with cementitious material. A new pipe installed inside the existing culvert eliminated the need for roadway excavation and traffic disruption. The traditional process involves excavating the roadway and replacing the existing culvert, which requires lane closures and traffic disruption and exposes travelers and workers to safety hazards. Through the U.S. 12 project, the Montana DOT learned that using trenchless technology eliminated traffic delays and lane closures, provided a safer environment for travelers and workers, eliminated costs associated with traffic control and roadway excavation, and potentially improved quality because the work was done in a controlled environment. 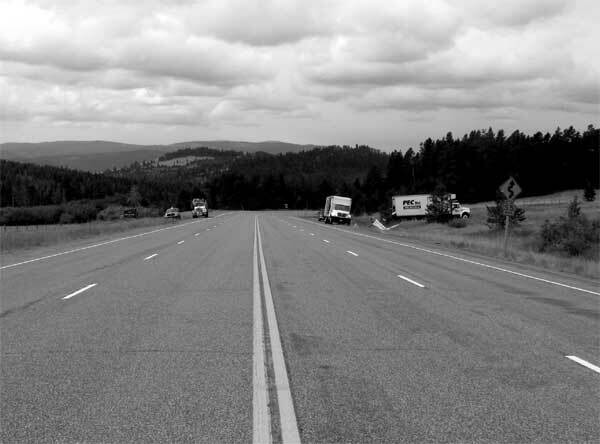 In its study, FHWA found that the Montana project easily met the Highways for LIFE performance goals for motorist and worker safety, construction congestion, quality and user satisfaction. No worker injuries or motorist incidents were reported during construction, which meant the Montana DOT exceeded the Highways for LIFE requirements for worker and motorist safety. The project also met the performance goal for reducing construction congestion. In fact, the project had no impact on traffic flow because the work was done beyond the edge of the road shoulders. Both the cured-in-place lining and sliplining systems improved the structural integrity of the existing culverts and have a life expectancy beyond 50 years. The new lining systems provide a smooth surface that reduces abrasion, enhances the fl ow of sediments through the culvert and maintains the culvert’s hydraulic capacity. Because the trenchless culvert rehabilitation techniques did not interfere with traffic flow, the Montana DOT received no negative comments from the traveling public about the project. According to a post-project survey, most travelers on U.S. 12 did not even notice the rehabilitation of the pipes because the construction activities were so inconspicuous. It cost about $75,000 more to use trenchless technology than traditional construction on the project, but it was the first time the Montana DOT had used the innovation so it chose a project on a lightly traveled highway to gain experience. In more congested areas, the trenchless technology could totally eliminate traffic flow interference and result in much lower user costs, boosting its economic feasibility. Innovative contracting methods can cut construction time, lower costs and produce higher quality, but not every method is right for every project: That’s the message from experts at a Web conference on accelerated project delivery methods for highway projects. The online session, which drew 100-plus participants from highway agencies and private industry, was part of the monthly "Innovations" series sponsored by Highways for LIFE and the National Highway Institute. The Federal Highway Administration has encouraged highway agencies to experiment with nontraditional contracting methods since 1990, said Jerry Blanding, innovative contracting engineer at FHWA’s Resource Center. The key to successful innovative contracting is "using the right product for the right project," said Blanding, who moderated the session and discussed cost-plus-time bidding, lane rental, warranties and design-build contracting. Cost-plus-time bidding, or A+B, "focuses on making sure the award of the contract is based on both the lowest price as well as the time it takes to complete the critical items of work," Blanding said. A+B contracting offers several benefits, including a shorter construction time and no significant change in quality. It also encourages the contractor to innovate when choosing equipment and technologies. The technique is best reserved for projects with great urgency and short duration, as well as for those with little potential for right-of-way and utility conflicts or field changes that could eat up time, Blanding said. Several states have used lane rental, a technique in which the contractor pays a fee for the time a travel lane is taken out of service during construction. "This technique minimizes the time roadway restrictions impact traffic flow," Blanding said. "If the contractor has an hourly rate for renting that lane for his use, he’s going to use no more time than necessary." Many states have also tried contract warranties, an assurance by the contractor that the product will perform as specified for a certain time period. At least 23 states have used asphalt pavement warranties on more than 700 projects, and 17 have used portland cement concrete warranties on about 370 projects. Blanding outlined issues to consider when using warranties: "Is the warranty going to be part of the contract criteria? What are the responsibilities of the contractor? Is there a conflict resolution team in place to resolve issues quickly? What are the requirements for corrective action?" Design-build contracting, in which the project’s design and construction phases are combined in one contract, has grown exponentially in recent years, Blanding said. It can be used on a statewide construction program or in an emergency such as a natural disaster to replace damaged facilities quickly. Advantages include one point of contact for both design and construction, enhanced opportunities to use innovation, time and cost savings, and better risk management. "We also see a lower incidence of claims because the design team and contractor are working together," Blanding said. Design-build works best on projects with a strong design component and without major right-of-way or utility issues, Blanding said. Keys to success include choosing a project carefully and developing a clear scope of work and criteria specifications. Dr. Douglas Gransberg, a University of Oklahoma professor, presented the results of research on how infrastructure owners choose project delivery methods. The researchers studied delivery method selection in three transportation modes: airport, transit and highway. They found that all of the methods studied—best value/ design-bid-build, construction manager-at-risk and design-build—have been used successfully on projects across the nation. Innovative contracting success depends on using the right project delivery method, according to Highways for LIFE Web conference speakers. The use of alternative project delivery methods "does require a culture shift from the old low-bid mentality," Gransberg said. "The bottom line is that owners should match the delivery method with specific requirements of the given project and use all three as appropriate. One size does not fit all." Jim McMinimee, former director of project development for the Utah Department of Transportation and now a principal engineer for Applied Research Associates, reviewed the Utah agency’s experience with construction management-general contracting. The CMGC project delivery method calls for the highway agency to make separate contracts with the contractor and designer and to form a project team of the agency, design firm and contractor. The agency has used CMGC on several projects, including a $140 million Interstate 80 project that was finished an entire construction season earlier than projected and produced savings of $25 million. In general, Utah’s CMGC projects have produced better designs, better schedules and lower costs, McMinimee said. Highways for LIFE is offering highway agencies a new opportunity to submit applications for financial incentives to build projects using innovative design or construction approaches. The deadline for applying for the fiscal year 2010 funds is August 31. Under Highways for LIFE, the Federal Highway Administration funds projects that use readily available but rarely used innovations that cut congestion while enhancing safety, quality and user satisfaction. The program is designed to encourage transportation agencies to make these innovations standard practice in their highway programs. Project applications must specify performance goals that define results in the Highways for LIFE focus areas of safety, construction congestion, quality and user satisfaction. Assistance is available in two forms: Highways for LIFE incentive grants or waiving of the matching requirement to allow 100 percent Federal-aid funding for projects. Agencies should send applications to their state FHWA division office. The division will forward the application, along with a recommendation, to the Highways for LIFE office for consideration. Projects are good examples of what’s possible in improving safety and user satisfaction, minimizing congestion, and achieving high-quality, long-lasting highway infrastructure. Projects demonstrate an array of technologies, techniques and approaches to achieve safe, high quality and long-lasting infrastructure while minimizing congestion. Projects are geographically dispersed, ideally with at least one project in each state. Projects can be used to promote innovation through such vehicles as showcases, workshops and peer-topeer exchanges. States plan to put the innovations into standard practice. "This new solicitation for FY 2010 is a great opportunity to use the appropriate innovations promoted in the Every Day Counts initiative," said Highways for LIFE Program Coordinator Mary Huie. FHWA’s Every Day Counts initiative is designed to accelerate the mainstreaming of innovation and shorten the delivery time of highway projects. So far, Highways for LIFE has provided financial incentives for 25 projects in 21 states. The projects feature more than two dozen innovations, including prefabricated bridge components, precast concrete pavement systems, work zone safety techniques, full road closures, high-performance materials and innovative contracting methods. One state’s effort to harness innovation and resources available to help other states do the same were the topics of a presentation at the Federal Highway Administration Field Engineers’ Learning and Development Seminar in Dallas, Texas. Bryan Cawley, construction and system preservation team leader in the FHWA Office of Asset Management, outlined the stages of process change needed to make an innovation happen. And Kathleen Bergeron, marketing communications coordinator for the Highways for LIFE program, summarized tools available to encourage highway agencies to innovate. Establish a sense of urgency. Create a guiding coalition of leaders. Empower employees for broad-based action. Generate short-term wins or successes. Consolidate gains and produce more change. Anchor new approaches in the culture. He traced those steps through the experiences of the Utah Department of Transportation, which has implemented several innovations in construction techniques and contracting methods. He told how a group of decision-makers observed rapid bridge construction methods with self-propelled modular transporters, platform vehicles that can move bridge superstructures, in the aftermath of Hurricane Katrina. 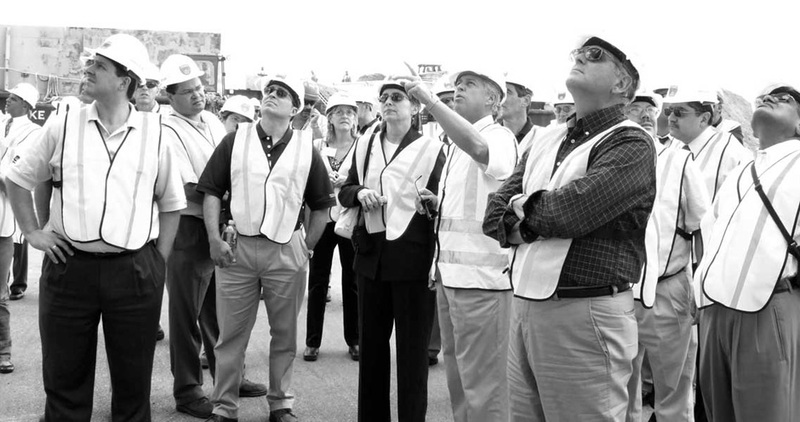 Cawley, former assistant division administrator in FHWA’s Utah Division, explained how the Utah leaders developed a vision and a strategy—that SPMTs could help accelerate bridge construction in that state. With a number of bridges nearing the end of their service life, both state and federal officials sought to get ahead of the curve and replace the bridges quickly. A short-term win occurred when one bridge over I-215 was replaced in just 52 hours. Construction impacts were reduced from months to hours, and SPMTs are credited with saving $4 million in highway user costs. What’s more, the Utah DOT developed standards for using SPMTs and wrote standard contract language for the construction management-general contractor process. As a result, the cost of SPMTs in Utah DOT contracts has come down, and they’re a standard way of doing business in the state. Bergeron followed Cawley by explaining how the Highways for LIFE program has spread the message of innovation around the nation through such vehicles as demonstration showcases, Web conferences, workshops, training courses, marketing communication materials and publications. For example, Highways for LIFE has offered Web conferences on several innovations, including accelerated project delivery, innovative contracting, use of recycled materials in roadway construction, high performance concrete and precast concrete pavement systems. The "Leap Not Creep: Accelerating Innovation Implementation" training course (FHWA-NHI-134073) provides transportation professionals with the tools to implement innovations quickly and successfully. The course discusses features of successful implementations, components of an implementation plan, and strategies for neutralizing challenges to using innovations. Highways for LIFE support is helping a number of innovations achieve more widespread use, Bergeron said. Among them are accelerated bridge construction, road safety audits, performance specifications, the safety edge paving technique, self-consolidating concrete and intelligent compaction. Bergeron ended the April presentation by challenging participants to innovate. Within 90 days, she said, they should determine a need in their state, identify an innovation to meet the need, develop an approach and select a tool for moving ahead. She quoted FHWA Administrator Victor Mendez, who said: "Together, we can find ways to shorten delivery time frames and develop new techniques to benefit the highway community and users." 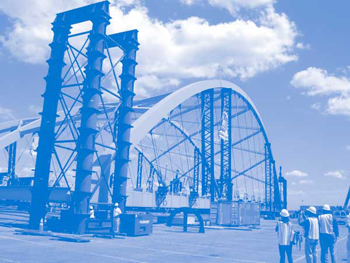 Demonstration showcases, such as one at which SPMTs were used to move a Rhode Island bridge span into place, bring highway professionals together to learn about innovation.